“It is estimated of the more than 230,000 incidences of surgical site infections (SSI) annually, more than 13,000 people die each year due to infections acquired during surgical procedures. —–U.S. Department of Health and Human Services (HHS). The main purpose of air filtration systems is to deliver clean, filtered, contaminant-free air over the operating room table with diffuser and airflow designed to remove – by laminar flow – all infectious particles down and away from the patient. 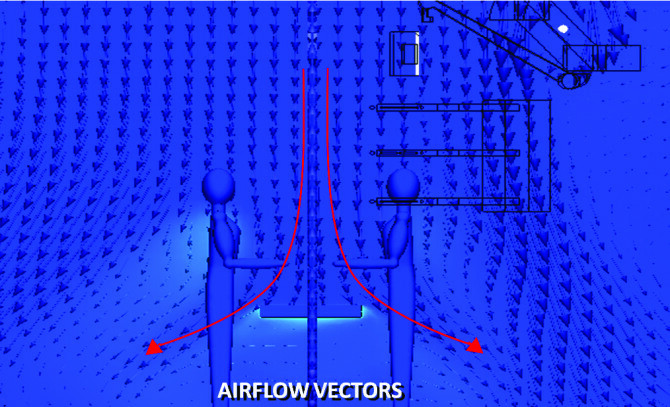 Unfortunately, many designs do not accomplish this airflow pattern and contaminates, many times brought into the OR suite by OR personnel, end up moving into the sterile operating field. 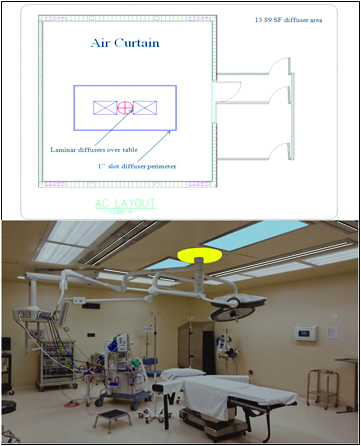 Currently, there are 3 “laminar flow” designs used in most hospitals; the air curtain (AC), multi-diffuser array (MDA), and the single large diffuser (SLD). The air curtain system is designed with two filtered air diffusers over the table separated by the OR light mounting device, and a perimeter of high velocity slot diffusers designed to move air away from the operating field. 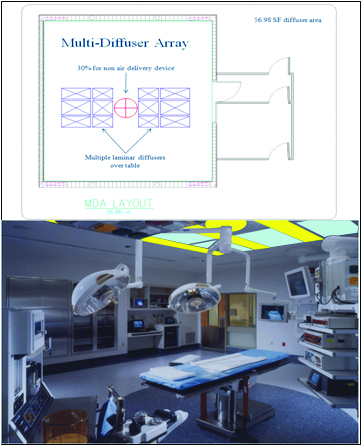 The multi-diffuser array typically has several filtered air diffusers mounted on either side of the OR table with a OR light mounting device separating them. Again, the design is supposed to move air down and away from the operating field. 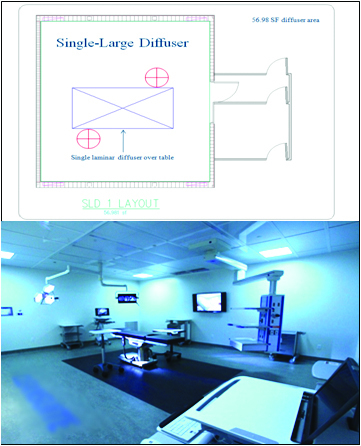 The single large diffuser (typically what is used in most cleanroom installations) has one large filtered air diffuser over the OR table with light mounting devices on either side of the SLD. Based on the research done in this presentation, the SLD performs best in 1) containing and moving contaminants down and away from the OR patient and 2) reducing gaps and blockages that can cause turbulence…turbulence causing particle induction and unpredictable results. 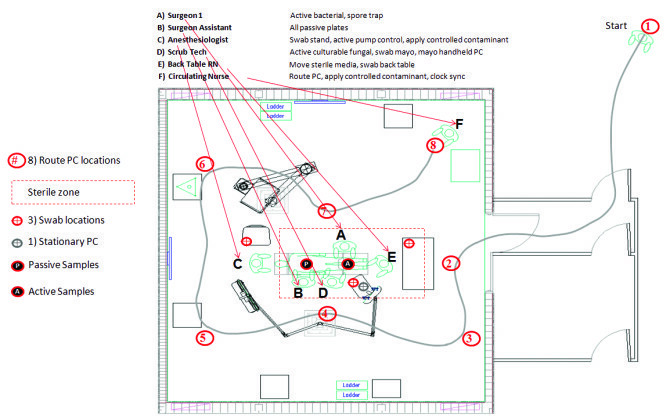 Dr. Wagner and her team built a full-scale surgical suite mockup, configured the space for multiple air delivery methods, devised a mock surgical procedure, assembled a full surgical team, tested multiple contaminants, multiple times with multiple scenarios, recorded several thousand data points, collected bacterial and fungal contaminants, and particle counts, submitted all data to an independent third-party lab, and analyzed the results and statistics which were validated by an independent engineering firm , Northwest Engineering Services. The team utilized the mockup for 7 days, approximately 12 hours per day doing the procedures. The position of all instrumentation, furniture and personnel were fixed so that they could be replicated with each different scenario. 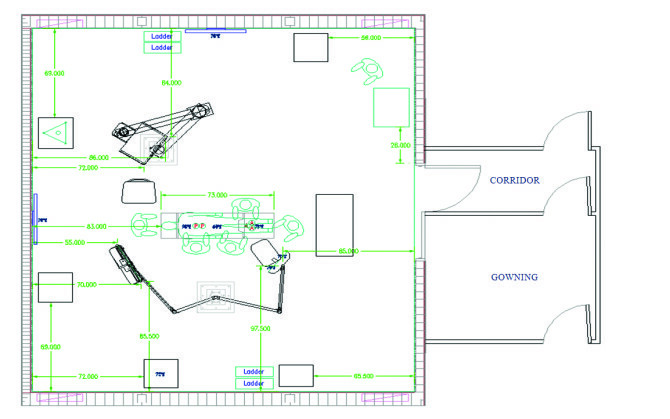 A sterile gowning and corridor were added to simulate typical cleanroom entrance design. A date and time stamped video camera was installed to record all of the events. Particle counters were also date and time stamped to refer back to any events of an unusual nature. All environmental conditions were held constant with 72% temperature, 30% relative humidity, and positive room pressurization of 0.01” w.c. For bacterial collection, Anderson samples were used along with two different types of agar media, two handheld particle counters were positioned, one in the operating field and the second circulating around the room, and instrumentation was devised to introduce specific contaminants into the space. To track a contaminant and its travel during a surgical procedure, Dr. Wagner used Saccharomyces cerevisiae (Baker’s yeast) and placed this on the backs of the surgical personnel gowns. 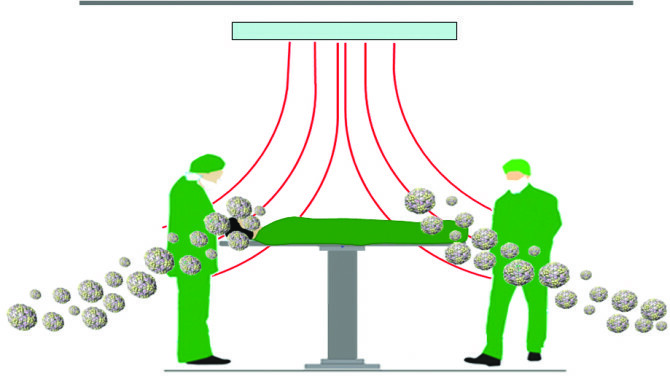 Active and passive sampling in locations “A” and “P” respectively in the picture were used to understand the travel during the air curtain, multi-diffuser array and single large diffuser experiments. One additional diffuser arrangement was added to the mix along with two different airflow speeds – a single diffuser that was approximately 30 sf larger – similar to the larger diffuser found in cleanroom applications was added giving the experiment an MDA with 30 and 50 fpm flow, a SLD with 30 and 50 fpm, and the larger SLD with 30 and 50 fpm flow. All conventional types of diffuser designs were able to reduce the bacterial count with the MDA and SLD providing the best removal rates. The 30 fpm MDA and the 30 fpm SLD1 both consumed the same amount of electrical power. Removal rates for fungal spores was highest using the SLD’s. Particle counts were lower in all cases with the lowest counts using the SLD’s. An interesting result of the comparisons of particle counts to microorganisms was that as particle counts were reduced, so were the microorganism counts. Again, the highest removal was found using the SLD’s. Using the environmental sampling strategy of USP 797 as a guide, the different diffuser challenges, with regard to contaminant particle counts, was used to give an ISO classification for cleanliness. The SLD’s provided optimum particle removal to achieve the highest ISO cleanroom classification of ISO 5. Using 0.5 micrometer particles from the ISO chart, the ISO 8 Classifications (MDA configuration) allows for 3,520,000 particles per cubic meter versus and ISO Classification of 5 (SLD configuration) which would allow for 3,520. The SLD performed better than either the AC or the MDA in removal of both bacterial and fungal contaminants. The SLD was the only configuration to meet the ISO Class 5 requirement or better with no detectable microbial growth. The AC design (as tested) was not effective at eliminating either microbes or particles from the space. There may be a correlation between total particle counts and microbial load. Future studies are planned to further research and document the effectiveness of LSD and airflow in the OR suite to eliminate SSI’s. Dr. Jennifer Wagner, PhD. established Prism Environmental Health and Safety Solutions, Inc. in 2011 to focus her expertise on reducing risk and managing liability for the healthcare, architectural and engineering industries. She holds a BS degree in Genetics and a doctorate degree in Molecular Biology and Biochemistry from the University of California, Davis. Her current focus is on reducing HAI’s through research, education and consulting.